West Virginia is home to more than 40 colleges and universities, encompassing a roughly equal number of two-year and four-year schools. Beyond traditional colleges, the state has several trade schools that offer business and technical concentrations. Additionally, West Virginia has a few colleges featuring special programs in Bible studies and Osteopathy. With such a variety of options available, it can be difficult for some students to choose the right school for them. When evaluating their college options, students should consider several factors across schools, from tuition to academic offerings. 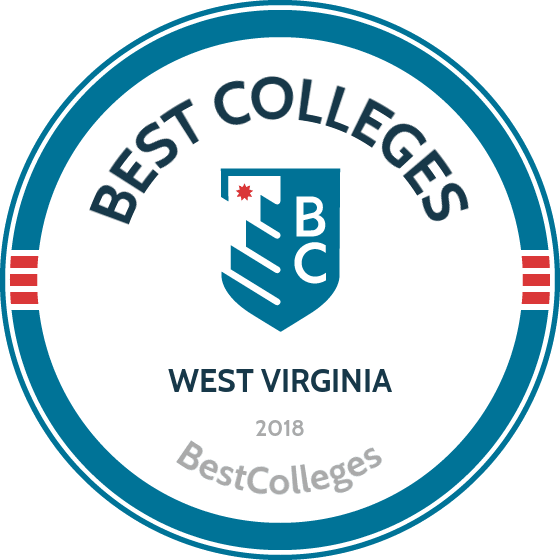 To help prospective students with their research, we have applied our rigorous methodology to the latest education data to rank the best colleges in West Virginia, including the top four-year and two-year schools. Our algorithm weighs all of the factors students value in a college, and effectively determines the top programs in the state. Below, you'll find our list of the best colleges in West Virginia. West Virginia's four-year universities include research and land-grant institutions, liberal arts colleges established in the 19th-century and renowned HBCUs. West Virginia's oldest surviving postsecondary school is Bethany College, which dates back to 1840. The American Public University System is the state's largest postsecondary institution, offering four-year programs with a unique distance learning delivery option. West Virginia University is the largest not-for-profit school in the state, with 29,707 students on campus. It is also the state's flagship school and the only college in the state classified as a research university. West Virginians with a bachelor's degree earn a higher salary than those with a high school diploma. The earning gap between residents with a four-year degree and non-degree holders will likely grow in future years, particularly as the number of jobs requiring certification rises. Consequently, it's never been a better time to consider earning a bachelor's degree. If you're interested in attending college in West Virginia, you can begin your research by taking a look at our list of the top schools in the state, presented below. Founded in 1837 as the namesake of John Marshall, the fourth Chief Justice of the United States, Marshall now operates four campus locations and serves a student body of more than 13,631. Marshall offers 59 bachelor's degrees across 11 academic departments including the School of Pharmacy and Arts and Media. The BS in Park Resources and Leisure Services is among the university's most popular degrees, offered through the School of Education and Human Services. Programs are strongly supported by campus groups created to serve veterans and military students, encourage community involvement, and provide student legal assistance. Marshall has developed its own comprehensive first-year experience for freshman undergraduate students on campus, including a Week of Welcome, new student orientation, and first year seminar course. 70% of Marshall's student body are in undergraduate studies, and 21% of there students are from out-of-state. Noteable Marshall alumni includes Randy Moss, Billy Crystal, and Mike D.Antoni. Founded in 1867 as a land-grant institution, WVU is one of the only colleges in West Virginia to receive the highest research accreditation of doctoral universities, according to the Carnegie Classification of Institutions of Higher Education. The university offers 133 undergraduate majors: exercise physiology, engineering, and biology are the most popular. Numerous research and academic scholarships have earned West Virginia national recognition; the university is home to 46 Fulbright Scholars and 24 Rhodes Scholars, among other awards and fellowships. Professors at WVU are dedicated to providing guidance and mentorship in addition to academic excellence in their respective fields. Among the 85% of full-time faculty that hold terminal degrees at WVU, 19 have been named Carnegie Foundation professors of the year. As part of the West Virginia University system that spans numerous locations across the state, WVU maintains 10 experimental farms, four forests, and a 4-H Camp on the Jackson's Mill campus. Founded in 1961 as a branch of West Virginia University, WVUP became an independent institution in 1971, making it one of the first comprehensive community colleges in West Virginia. Today, the school offers a wide selection of bachelor's, associate, and certificate programs to around 2,600 students annually. At the associate level, WVUP offers unique professional programs in areas such as chemical and polymer operator technology, drafting, multi-craft technology, and welding technology. Students can also pursue dozens of transfer programs that allow them to begin their studies degree at WVUP before transferring into a four-year college. Some notable transfer degrees include aerospace engineering, animal and nutrition science, mining engineering, criminology, and international studies. The school also offers several bachelor's degrees that can be completed entirely through WVUP, including accounting, child development, digital communications, legal studies, and software engineering. For parents working towards their degree, the school provides an on-site childcare center. Shepherd was founded 145 years ago as a liberal arts institution in Shepherdstown, the oldest territory in West Virginia. Its inaugural group consisted of just 42 students in 1871. The university has grown to include numerous historic buildings on both an east and west campus that serves more than 3,000 students each year. Shepherd was designated a four-year university and began granting a Bachelor of Arts in 1930, followed soon after by liberal arts programs and BS degrees. Business, psychology, and education are among the university's most popular majors. Shepherd offers a veterans' support program through counseling and disabilities services in Shepherdstown and Martinsburg. Shepherd University hosts the state's first and only chapter of Team River Runner. This group facilitates kayak-training events, hydrotherapy, and other water sports for veterans on campus and in surrounding communities. Shepherd students have many internship opportunities with Baltimore and the District of Columbia 90 minutes away from campus. Bluefield State, established in 1895 to educate the children of local African-American coal miners, has a Historically Black College and University (HBCU) designation. The school offers two campus locations across West Virginia to serve urban and rural student populations. The Beckley campus serves students in Raleigh County and supplements the main campus in the hills of Bluefield, West Virginia. The college offers a variety of bachelor's degrees spanning five academic departments that include social and applied sciences, education, and engineering technology. More than 60% of students at Bluefield State earn degrees in nursing, biology, engineering, and other STEM majors. Student support services offered on campus include seminars, workshops, and peer mentoring. Bluefield offers unique cultural enrichment trips each semester for students so they can experience historical sites and cultural events outside of their immediate surroundings. Bluefield State helps maintain a passionate alumni community. West Virginia Wesleyan serves nearly 1,400 undergraduate students on its campus in Buckhannon, one of the state's smallest towns. The campus includes two nine-hole golf courses and sits alongside a scenic hiking and biking river trail. Wesleyan has hosted 11 Fulbright scholars within the last six years, and continues to be among the best colleges in West Virginia for producing state-sponsored PROMISE scholars each year. The school offers programs in more than 49 majors; the most popular majors for undergraduates include education, nursing, and exercise science. The university has more than 70 student groups on campus, including 21 NCAA Division II athletic teams, nine national sororities and fraternities, and summer camps for gifted and athletic students. A liberal arts institution formed in the Wesleyan Methodist tradition, the university offers Chapel services, spiritual and religious counseling, and partnerships with local churches to help students integrate faith and spirituality throughout their academic pursuits. Potomac State encompasses 31 buildings across more than 800 acres to serve a student enrollment of 1,540 in Keyser, West Virginia. The college opened in 1902 at the former site of Fort Fuller, a critical army supply route during the Civil War. Potomac State is among the best two-year colleges in West Virginia but is not limited to associate's degrees. The school offers more than 50 undergraduate programs designed to fast-track vocational skills and lead to further study within the West Virginia University system. Potomac offers a bachelor's degree in business management, computer information systems, and criminal justice. A four-year Regent's Bachelor of Arts (RBA) is available for recent high school graduates to combine college credit and life experience. Potomac practices comprehensive safety measures on campus with the Behavior Intervention Team and the See Something Say Something policy. Potomac partnered with EverFi to require all students age 21 and over to complete the AlcoholEdu course on critical abuse prevention skills; Students who fail to complete both parts of the course and earn a passing score will be fined through their student account. Established in 1895 as a member of the West Virginia University system, WVU Tech currently serves more than 1,200 students at two campus locations in Montgomery and Beckley. In 2017, the university will consolidate to operate solely from its Beckley location. Over 40 academic programs are offered at WVU Tech and are available through the college of business, humanities and social sciences and the college of engineering and sciences. The school is one of a few colleges in West Virginia, and in the nation, to offer nine ABET-accredited engineering programs. WVU Tech's beloved Golden Bears are competitors in more than 15 men's and women's varsity sports teams. The university is dedicated to providing a diverse range of student engagement opportunities, incorporating both technology and traditional concepts. Students are encouraged to explore both the Tech Adventures Club and intramural sports activities. Fairmont State, founded in 1865 as the state's first private "normal" school, celebrated its Sesquicentennial in 2015. The university has continued to expand into one of the best colleges in West Virginia for high technology programs. Bachelor's programs are available in traditional majors as well as aviation technology, civil engineering technology, and computer science. The school's main campus is set among 120 acres in Fairmont, with a satellite campus in nearby Clarksburg, and a national aerospace education center in Bridgeport (home to many of the university's specialized aviation programs). Students on campus can take advantage of a high-tech IT Commons for sharing ideas and receiving IT support. The Commons is located within the library and staffed by Help Desk techs that provide free wi-fi and comprehensive technical support for student devices and online Fairmont accounts. There are more than 80 student organizations at Fairmont State University, from Greek Life to an Anime Club. Ohio Valley University offers Christian, liberal arts programs that integrate faith-based service with higher education. Chartered in 1958 by members of the churches of Christ, the university occupies 266 acres atop one of the highest points in Wood County. OVU offers a variety of bachelor's degrees through four schools of study, including an integrated BA or BS in Bible and ministry through the College of Biblical Studies and Behavioral Sciences. Majors offered include Christian service for women and vocational missions. At 91%, the school's graduate placement rate is higher than many colleges in West Virginia and the national average. Bible professors often host fellowship and symposia in their own homes, for students in the Bible and ministry major. The university is home to several "niche groups" for campus students, exploring everything from social media to ultimate frisbee to theater interests. OVU also offers daily chapel services and weekly devotionals on campus in Vienna, West Virginia. Concord University, established in 1872 in Athens, West Virginia, encompasses a sprawling campus with more than five residence halls, a health clinic, football stadium, and an Autism Center. Concord leads colleges in West Virginia in cost-conscious programming; its graduates have the lowest average loan debt among four-year colleges in the state. The school offers a variety of BA, BS, and BSW degrees in popular majors such as business, pre-med/biology, and teacher education. The student body is over 2,800, and 65% of them are the first generation in their family to attend college. Concord operates its own Counseling Center, Office of Multicultural Affairs, and confidential Sexual Assault Response Team on campus. A veterans coordinator is available, on-site, for military students in need of academic, personal, and financial counseling services. Families may participate in the university's Parent Club, which helps keep them informed of important deadlines and current on-campus events. Davis and Elkins, located in the Allegheny Highlands of West Virginia, encompasses 23 buildings on its 172-acre campus. The college is affiliated with the Presbyterian Church and the Presbytery of West Virginia. It aims to unify intellectual and spiritual pursuits in higher learning and in life. The school offers eight baccalaureate programs in 39 areas including traditional arts and sciences and pre-professional studies; business, nursing and education are the most popular majors for bachelor's degrees. A hands-on experience is promoted by offering a variety of unique travel opportunities and study abroad programs. Students will complete experiential internships, field research, and service projects in the local community. As one of the most celebrated mountain colleges in West Virginia and on the east coast, Davis and Elkins offers students unique access to a variety of outdoor activities including camping, canoeing, skiing, and snowboarding. Fondly called "lighthouse on the hill" by locals, Glenville State is the only public West Virginia college that is centrally located. The school was founded in 1872 to educate teachers; Today, Glenville State offers a variety of programs in not only education but also business, liberal arts, human services and more. The college offers undergraduate programs in more than 40 majors, as well as specialized teacher education degrees and certificates. In addition to on-campus services including a Health Center and peer counseling, Glenville State hosts its own High Adventure outdoor adventure camp that organizes up to eight optional excursions per semester. Eligible undergraduate students are encouraged to join the Student Government Association and/or the student-run Pioneer Media organization, and participate in annual Homecoming activities. A private college located on the banks of the Kanawha River, UC is one of the smaller schools in West Virginia. The college serves around 2,400 students and boasts small class sizes in many of its programs. The college offers dozens of undergraduate programs in the arts and sciences, business and leadership, health sciences, and pharmacy. Unique degrees include sport business, radiologic science, movement science, frontline leadership, and pre-professional veterinary medicine. UC also offers multiple master's degrees in the areas of business and pharmacy, and for physician assistants. Postgraduate students may pursue the school’s doctorate in executive leadership. The college's active campus culture provides many opportunities for student involvement, including community service, intramural sports, organizations and clubs, and student leadership and education. The UC Office of Community Life connects students to local volunteer opportunities and coordinates service learning activities on campus. The school hosts several clubs, including academic honor societies, student government, professional organizations, and special interest groups. West Virginia's two-year colleges provide accelerated programs that prepare students for careers in local industries. The Community and Technical College System serves the largest student body in the state, operating ten campuses statewide. Community college programs within the system are primarily focused on tech careers, with specific concentrations in subjects like business, accounting or health care services. Additionally, some two-year programs offered at West Virginia's community colleges provide two-year degrees in paralegal studies, design or liberal arts. In any concentration, two-year schools in West Virginia provide a fast track for students looking to join the workforce immediately after graduation. West Virginians who earn a community college degree often earn higher salaries than residents with only a high school diploma. With an economy dependent on a number of high-tech industries — including biotech, aerospace and automotive manufacturing — community college students get relevant training and have the opportunity to gain valuable work experience while obtaining their degree. Below we've profiled the top two-year programs in the state. In the profiles, you can learn about each school's relative strengths, academic offerings and other important information. Serving students in Kanawha County and the surrounding territories, Carver Tech offers professional training and continuing education to those beginning their careers. The school aims to provide certificate and short term education programs that provide employment or career advancement. The school offers more than 20 secondary and adult programs in fields that support not only local industry in West Virginia, but are applicable for employment throughout the U.S. Programs include hospitality and hotel management, technology, and health sciences. Unique majors include HVAC technology, pet grooming, plant systems, and collision repair technology. Carver even features a distinct barbering program, set apart from those offered through its Cosmetology Academy. The school is renowned among community colleges in West Virginia for providing high school students with the opportunity to earn accelerated college credit before they graduate through the Earn a Degree -- Graduate Early (EDGE) initiative. With a student enrollment of just 132, Mercer County Tech is among the best community colleges in West Virginia for personalized instructor attention and modest class sizes. The school specializes in adult and professional programs centered on administrative and business support, health sciences, nursing, and technical career skill development. Mercer offers a variety of associate's degrees, certificates, and training programs. Non-traditional options are available through the schools adult evening and community education initiatives. The school's Simulated Workplace Initiative implements a workplace environment into their programs, this includes random drug testing, attendance, and safety requirements. Mercer is home to a branch of the National Technical Honor Society, and a member of the SkillsUSA partnership, which maintains a working relationship between higher education institutions and employers in local industry to prepare students for the workforce in their respective areas of study. Mercer is home to a Division of Rehabilitation Services, the program's goal is to help people with disabilities become working citizens. BridgeValley was formed in 2014 as the result of a merger between Bridgemont and Kanawha Valley community and technical colleges, spanning a six-county service area in south-central West Virginia. The school was among the first two-year colleges in West Virginia to offer tech programs as early as the 1950s at a facility formerly named West Virginia Institute of Technology. Today the college offers more than 40 associate's degrees and certificates in a wide range of majors emphasizing technology, applied and natural sciences, and healthcare professions. BridgeValley offers a customizable general education degree and flexible transfer options for students looking to continue on toward earning a bachelor's degree. The college co-sponsors an employee-preparation program with global automotive metal component manufacturer, Gestamp, that includes mechatronics and tool and die training for interested student prospects. Students have the opportunity to earn credit for prior learning; military service, independent studies, and industry certifications and licensures count as prior learning. Established in 1971 as an independently accredited, single-facility institution, Southern West has grown to encompass five campus locations and an 11-county service area spanning the state of West Virginia. The university offers numerous associate's degrees, certificates, and professional training programs in allied health, applied and industrial technology, business, humanities, and social science. Non-traditional, online, and transfer programs are also available. Southern is celebrated among West Virginia community colleges for its veterans services. The campus includes a dedicated club lounge designed to create a welcoming environment for veterans and military students to share resources and provide informal peer-to-peer counseling opportunities. The school offers comprehensive tutoring, career placement, and disability services provided on-site. Northern upholds a formal petition process for students looking to start a new club, group, or organization in a particular area of academic, social, cultural, or political interest within the campus community. West Virginia Northern, established in 1972, is among the best community colleges in West Virginia for its comprehensive approach to vocational two-year programming. The school operates campuses in Wheeling, Weirton, and New Martinsville, offering more than 70 undergraduate programs in the liberal arts, career training, and continuing education. Majors include applied technologies, culinary arts, cyber security, and health care professions. Northern has an extensive distance learning program, offering both certificates and degrees. West Virginia has on-campus student groups in Student Government Association and the Community Outreach Opportunities Program, including additional recreational and intramural sports, movie nights, and more. Each semester starts off with multiple welcome events on all campuses. West Virginia Northern honors its beloved mascot--the thundering chicken--with a traditional month-long Chicken Fest celebration each September. Many of Northern's degrees are easily transferred to other four-year institutions. Blue Ridge traces its modest beginnings back to 40 years ago, when CTC Shepherd, as it was then known, unofficially occupied the basement floor of a residence hall on the Shepherd College campus. The college was later moved to a location in Martinsburg, and has since come into its own among two-year colleges in West Virginia, encompassing an additional Morgan County location and its own Technology Center. Blue Ridge offers both an Associate of Applied Science for students looking for an accelerated career training program, and an Associate of Arts in Liberal Arts in various majors for students who plan to pursue a four-year degree. Available majors span areas of study including culinary arts, engineering, health sciences, and technology. Student services on campus place an emphasis on career placement, with comprehensive job preparation advising, internship and networking opportunities, and recruiting events. Located among the Highlands of the Potomac, Eastern has served students within a six-county region of northeastern West Virginia for more than 15 years. The school maintains an "open door," equal opportunity policy that promotes case-by-case consideration for admission into its undergraduate and professional programs. Eastern offers several associate's degree, available on campus and through distance learning methods, in traditional majors including business, education, and nursing. Unique majors in wind energy technology, automotive technology, and electromechanical technology, are what set Eastern apart from other West Virginia community colleges. The school offers customized degree plan options. Eastern has been noticed as a military friendly college and does what it can to ensure veterans gain a quality education. Eastern has partnerships with nearby schools to ensure maximum transferability of credits for students who want to earn a baccalaureate degree. Partnerships include Strayer University, West Virginia University, and The Art Institute of Pittsburgh. New River Community and Technical College encompasses four locations across the state of West Virginia. The school is the newest technical community college in West Virginia. It was founded in 2003 to serve a nine-county area spanning multiple campuses and satellite facilities. The school offers an Associate of Science and an Associate of Applied Science in more than 25 majors, including certificates and specialty certificate options. Top majors for the AS and AAS degrees include healthcare professions, social sciences, and technology; numerous concentrations in business and criminal justice are also available. Student services on campus include career counseling, placement testing, and free tutoring. New River is in the process of expanding its off-campus enrichment opportunities, which currently include workforce education programs and alumni networking events. The school offers community education courses for people looking to learn a new hobby or learn about something more specific. Course offerings include retirement planning, digital photography, and piano. Mountwest operates three campuses throughout Huntington, West Virginia, including a location dedicated to culinary arts and a Maritime Academy in addition to the main campus. The Maritime Academy includes deckhand training, radar training and recertification, and a Tankerman course. Programs are designed to be delivered in a contemporary setting, with comprehensive faculty support and technological resources available to all students. Campus classrooms are outfitted with state-of-the-art computers and technology. Tutoring is free and students have access to personal mentors and college transition programs through the one-stop student services center. Mountwest offers more than 50 associate's degrees and one-year certificate programs in liberal arts majors and other professional areas. The school is among the best community colleges in West Virginia for highly customizable programs in allied health and information technology. Mountwest offers programs in geospatial science science and technology, information technology, and coding online through the Blackboard learning management system. Pierpont shares a scenic 120-acre campus with Fairmont State University in Marion County, West Virginia. The school occupies two branch locations in addition to its Fairmont campus, serving a 13-county region across the state. The college's branches are focused on maintaining specialty programs including the AAS in physical therapist assisting and the aviation maintenance degree. Pierpont offers more than 40 associate's degrees, certificates, and professional programs in a variety of traditional and non-traditional areas. Top majors include business technology, criminal justice, and food service management. A collection of more than 80 student groups and clubs offered on campus include Greek Life, intramural sports, numerous Honor Societies, and student government opportunities. Students at Pierpont have access to free tutoring and student advising. Pierpont is accredited by the Higher Learning Commision. Students who have been out of high school for five or more years do not need to submit ACT or SAT scores. If you're thinking about applying to one of the best colleges in West Virginia, continuing reading to learn more about living in the Mountain State. Bordering several geographic regions, West Virginia is often referred to as part of the South, Southeastern and Mid-Atlantic part of the country. Known as the “Mountain State,” West Virginia is the only state that lies entirely within the Appalachian Mountains. With such distinctive terrain, the state's economy is naturally dependent on the logging and coal mining industries. Residents enjoy outdoor activities, including hiking, fishing, whitewater rafting and hunting. West Virginia's culture includes Native American history, Appalachian bluegrass music and folk tradition. That culture has produced a blue-collar workforce driving the production of natural resources for the local and national economy. West Virginia had a per-capita income of $23,450 as of 2016. In addition, 19.2% of West Virginians 25 and older had a bachelor's degree or higher, well below the national average of 29.8%. Approximately 84.4% of residents age 25 and older had at least a high school diploma, which is slightly below the national average of 86.3%. Establishing residency qualifies students for in-state tuition at public colleges in West Virginia. Students 18 or older must provide proof of residency; minors must live with a parent or legal guardian with residency in West Virginia to qualify. To prove West Virginia residency, a minor must demonstrate that their parents or guardians live in the state. If the parents are divorced, the student must reside with a parent living in West Virginia. Minors must begin living with their parent in the state prior to turning 18 and prove their intention to continue living with that parent until school begins. You must physically reside in West Virginia for at least one year prior to declaring residence. You must prove intent to make West Virginia your home.